I want to share a real gem of a shop with you! This shop stems from a family based beekeeping business in Oregon. Clear Hills Honey Company are the creators of many wonderful honey products, not least of which are some of the most delicious lip balms you'll ever smooth on in a plethora of flavours! I always enjoy working with Carmela from CHH, and was so excited to try out her newly developed Beeswax Crayons. A staple in the Waldorf educational system, beeswax crayons are made with beeswax rather than paraffin and have the added bonus of blending more smoothly (like paints) than regular paraffin based crayons. They are completely non-toxic and made with natural pigments, too. We just received our 5 colour (pictured) set and they are a hit with our 33 month old. The decorative tin was a nice touch, too (5 to choose from)! (Picture of a pair of bees and a turtle, courtesy of Rowan). The colours are more muted than your usual Crayolas, and the texture is different (they do have a gentle beeswax scent, but not overpowering~ generally I am sensitive to beeswax smelly things and these are fine for me! )~ not soft, although they are softer by nature than regular crayons~ but with a bit of that beeswax 'stick' to them. Nonetheless, they flow smoothly and easily and are definitely a great alternative! Having looked into making beeswax crayons ourselves and having chosen to run away from the complexity, we admire Carmela and her innovative new product and wanted to share it with others! 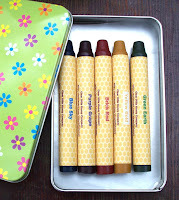 I also have to throw in a good word for the Busy Bee Bath Crayons (non toxic, natural pigments)~ gentle on skin, easy to clean up with the included sponge (kids will clean it themselves!) and lots of fun! So take a peek at Clear Hills Honey Company~ I am sure you'll find something to love!